For decades, hard chrome plating has been used to provide corrosion, erosion and wear resistance while also providing a high-gleam mirrored surface. The process does have limits according to the size of the part and thickness buildup. Because the process requires highly toxic acids and chemicals, hard chrome plating is heavily regulated, driving the costs of the process up because of environmental hazards and disposal requirements. Two alternatives to hard chrome plating are thermal spraying and spray chrome. 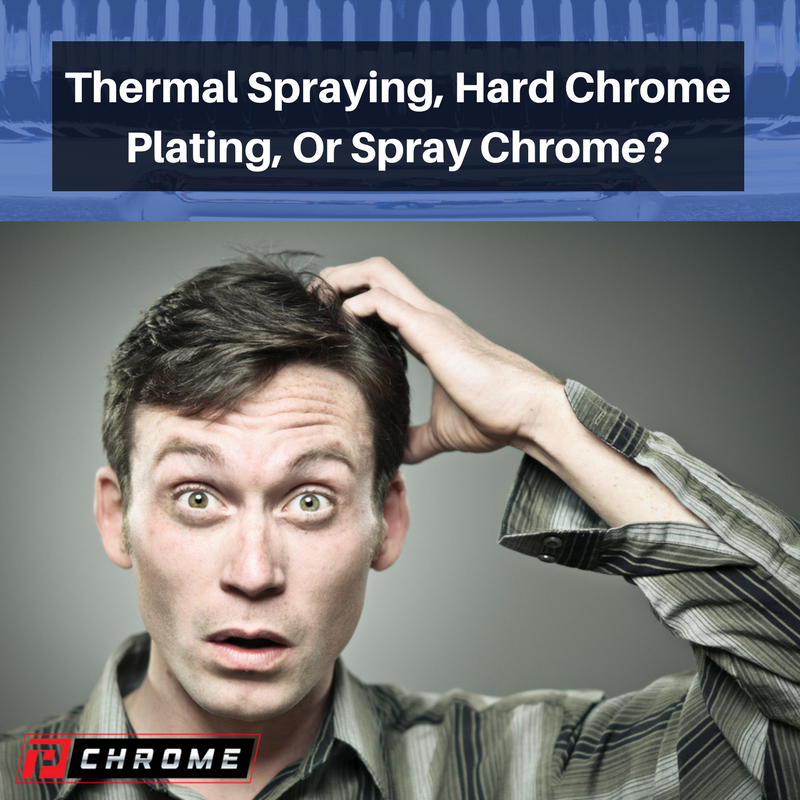 While each process has its advantages, spray chrome offers more benefits than either hard chrome plating or thermal spraying. Here is what you need to know about each process, their advantages, and their disadvantages. Capital cost: The capital expenditures that are necessary for establishing facilities having similar production capabilities are much higher for chrome plating than they are for either thermal spraying or using chrome spray. 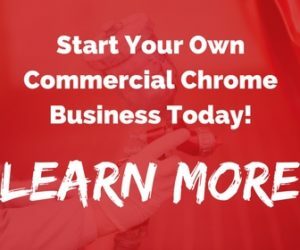 Chrome spray doesn’t require that a separate facility is established at all, while thermal spraying does, meaning chrome spray is the least expensive of the three. Space requirements: Thermal spray facilities require much less floor space than plating facilities, and chrome spray can be completed in your existing shop or garage without the need for a facility. Waste Disposal: The effluents that are produced in the chrome-plating process are highly toxic, and disposal costs are high because of regulations governing the disposal process. Thermal spraying produces metallic dust, which has relatively low disposal costs. Chrome spray does not use the toxic chemicals that are used in chrome plating, and disposal is made according to local guidelines. Diversity of materials: A chrome-plating facility is completely committed to one coating type. Thermal spray facilities offer the capability of producing a range of coatings, and the place at which chrome spray is applied can have multiple uses beyond coatings. Chrome plating requires more than twice as many process steps as compared to either thermal spraying or chrome spray applications. This means that hard chrome plating takes much longer, greatly increasing the turnaround time for parts that are chrome plated versus parts that are either thermally sprayed or spray chromed. There are a number of benefits of chrome plating. The process offers a high value of hardness of Vickers 700 to 1000. It also has a well known and established process that has known properties and limitations. Obtaining surface coverage does not involve a line-of-sight process, which means that it can be used on inside diameters with complex geometries. Chrome plating also provides an excellent finish. A coated surface finish that has been chrome plated will be approximately 40 RMS. Finally, chrome plating is reliable for making very thin deposits ranging from 0.001 to 0.004 inches of thickness. Hard chrome plating has multiple limitations. The adhesion may be poor on iron-based materials. If surfaces are not properly prepared, the adhesion may be poor. Micro-cracking may occur in plating because of residual stresses. If they extend down to the substrate, the plating may separate away from it. The process is also very slow with about an hour required to deposit a thickness of just 0.001 inches on a part of any size. Chrome plating may also have nodules of excess plating that builds up on corners and edges because of a high current density. This can then cause residual stresses, which may lead to adhesion problems. Plating requires that parts are totally submerged, making it hard to mask areas that do not need plating. Finally, contaminants may be introduced into the tanks which may make reproducing plating quality difficult. Thermal spraying requires a much lower capital investment in required equipment than chrome plating does, and installing a thermal spray system takes less time and has lower installation costs than for chrome plating. Thermal spraying does not produce toxic waste, but it does produce metallic dust that requires special disposal. For large parts that require high coating thickness values, thermal spraying is cost competitive with chrome plating. Like chrome spraying, thermal spraying is not limited by part size while chrome plating is. Thermal spraying has a higher rate of deposition than chromium plating does. The equipment used for thermal spraying is portable, meaning that it can be used on-site. Thermal spraying requires fewer process steps, offers thicker and denser coatings and offers a uniform coating thickness when compared to chrome plating. Finally, people have a good materials choice with thermal spraying that they simply do not have with traditional chrome plating. Since thermal spraying uses a line-of-sight process, complex geometry may require substantial automation programming. Thermal spray may involve sound outputs that are as high as 135 dB, requiring noise attenuation. Thermal spray processes will produce dust particles that must be collected for disposal. The process also requires a thorough understanding, which means it carries a steep learning curve. Spray chrome is by far the least expensive choice for people who want to achieve the high-gleam, durable finish of chrome. It does not use the toxic chemicals that are required by chrome plating, and any waste may be disposed of according to local guidelines. PChrome chrome spray is very versatile and may be used on parts of any size. It is available in a broad range of colors and may be applied in your existing shop or garage. A great benefit of spray chrome is that you do not need to purchase expensive equipment in order to be able to use it. It also can be used on many different substrates, including glass, wood, metal, plastic, paper, canvas and others. PChrome chrome spray provides the same look of traditional plating with coatings that are just as durable. It requires much lower capital expenditures than either traditional plating or thermal spraying. Like thermal spraying, spray chroming involves a line-of-sight process. This means that it may be difficult when you are dealing with inside diameters or complex geometries. Applying it correctly does involve a learning curve, but the learning curve is much easier than that required for thermal spraying or for chrome plating. While each process has its own benefits and limitations, chrome spray offers the most advantages when comparing the three coating methods. Some industry sectors are moving away from chrome plating to embrace alternatives such as thermal spraying or chrome spraying. Because chrome plating is established within industries, chrome spray and thermal spraying will likely supplement its use. 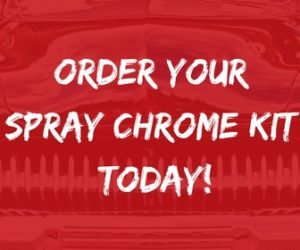 To learn more about PChrome chrome spray or to place your order, call us today.